One of the most academically and critically acclaimed films of all times, Persona is a precious jewel in the history of world cinema. Its creator Ingmar Bergman had relentlessly stretched the boundaries of what we call cinema today throughout his career, but never before (or since) as significantly as he did with Persona. Many brilliant critics and academics have analyzed the bottomless depths of Persona. Here, I will concentrate on a few points that personally resonate with me every time I watch it. The word ‘persona’, Latin meaning of which is ‘mask’, is central to Elisabet’s life in the theatre, where the pretense of taking on different identities, or masks, is the name of the game. Elisabet drops this pretense in the middle of a performance like dropping a mask that has long been unbearable. Her silence on the other hand becomes just another mask to hide behind in order to escape the demand for confessions and deliberations. Elisabet’s safely established new ‘role’ as a sick woman shields her fears and social discomfort behind a veil of silence. However, Bergman himself often talks about silence as having the quality of containing ‘the only truth’. This duality behind the experience of silence on the part of the troubled soul is interesting: Is silence the only way out of the insufferable ‘chasm’ or is it simply not possible to avoid this chasm no matter how and how much you try to remove yourself from responsibility of expression. 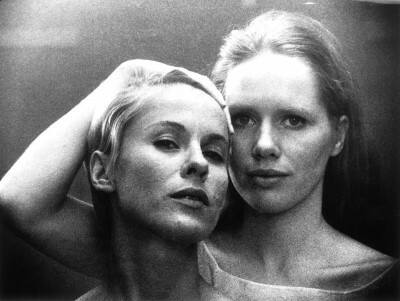 Enters Alma (Bibi Andersson), a young nurse, innocent of all self-doubt and questioning. Her future is laid out in front of her and despite her mild insecurity and impulsiveness, she is perfectly capable of nursing Elisabet back to health with her casual ease and pleasant demeanor. Secluded in a summer home on an island, the two women forge an odd friendship, where Elisabet is the silent, compassionate observer and Alma, seemingly the patient lying on the psychiatrist’s couch, confessing all her sins. Alma finds a rare opportunity to open up and process her own existential angst to Elisabet, whose contrasting purpose is to be relieved from her extraverted existence. As Elisabet turns more and more inward, Alma exercises her multiple identities, suggesting that, if given the opportunity to release them, we all have a multitude of masks to potentially play out. When Alma feels betrayed by Elisabet, her dormant rage blossoms violently, making her transformation all the more fascinating. Alma, now interchangeably viewing Elisabet as confidant and traitor, goes on to challenge Elisabet’s sense of self by suggesting, almost revealing, that there may not be a ‘self’ behind all of Elisabet’s masks. In their hideout, the two women not only exchange their identities, but also begin to present a case in which they share one identity, or embody two sides of the same personality. Bergman slowly but surely blurs our narrative perception: are these women one and the same, perhaps living out a schizophrenic episode? Or are they the thesis and anti-thesis of one persona getting painfully enmeshed in one odd summer together? Bergman’s audacity in tackling one of the fundamental questions of existence is noteworthy. Don’t we all carry this self-doubt: Am I who I think I am, or who I seem like I am? If I were to remove myself from my world permanently and begin participating in a reality altogether different and, to top it all, if I were relieved from expressing my ‘self’, what would that ‘self’ turn out to be? And from Alma’s point of view, if I had the chance of being listened to without questions or judgment, what emotions and personalities would I have access to? Which demons would I be compelled to bring out? Bergman takes our experience of observing the collision of these two identities one step further by stressing the idea of the audience as active observers of the dream-like phenomenon that is Persona. From the ignition of a projector through to film cracking and burning on Bibi Andersson’s frozen face, we are reminded that cinema itself is a mask that’s forever hiding its meanings and intentions. Perhaps Bergman is suggesting there is no meaning and intention behind his complex narrative and perplexing images at all! Though Bergman himself refrained from explaining what he meant by Persona, he also wrote that, in Persona, he ‘touched wordless secrets that only cinema can discover’. Ironically, words are truly not enough to express what the elusive and marvelous Persona means to me. It is up to the audience to perceive and make meaning out of those wordless secrets for themselves and themselves alone.